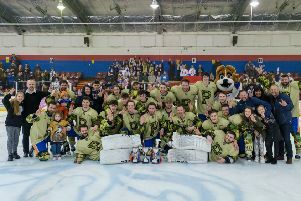 Phantoms celebrate their play-off success. But Phantoms defenceman Robbie Ferrara has achieved that remarkable feat twice in a decade. The 29 year-old was an emerging young talent when part of the city side that dominated the English Premier League landscape back in 2008/09. Spin the clock forward a decade and Ferrara has been one of the solid defensive rocks on which another Phantoms honours hat-trick has been built in a current campaign which has featured NIHL Autumn Cup, NIHL South Cup and NIHL Division One South glory. “It’s great to be part of a treble-winning team again,” said Ferrara. “I was a young kid back in 2008/09 and didn’t get much ice time so I’d like to think I’ve played a bigger part in our current success. “We all go through the tough times in sport, but we play for the sort of moments we’ve enjoyed this season. “We’ve come close to success in recent years, but we’ve managed to get our business done this year and it is great to have the three trophies to show for it. But Ferrara and Phantoms aren’t done yet as history beckons this weekend when they do battle in the NIHL Final Four. The city side head to Coventry with high hopes of completing an unprecedented quadruple. They take on North runners-up Sheffield at the semi-final stage on Saturday (5.30pm). North champions Hull and South runners-up Bracknell do battle earlier in the day (1.30pm). The two winning sides then clash in the grand final on Sunday when the puck drops at 5pm. Ferrara added: “It’s been great to be able to lift three trophies in front of our home fans and be able to celebrate with them, but there is still a hunger to get that last piece of silverware and be the overall play-offs winners. “We’ve always taken things one shift at a time and one game at a time – and we’ll continue to do that heading into Coventry this weekend. Ferrara has certainly been responsible for the youngest member of the celebration parties at Planet Ice this season with six-month-old son Tobias joining him on the ice in the wake of the trophy triumphs.